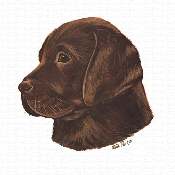 This Chocolate Labrador puppy portrait is available as a limited edition print, signed and numbered by Jane Partin. 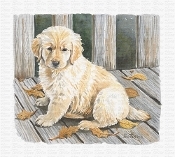 This Painting of these pupples and the pansies is availible as a limited edition Giclee print, signed and numbered by Jane Partin Framed Size: 10" x 14" UnFramed Size: 8" x 11"
This Labrador Puppy in a classic shell box is available as a limited edition Giclee print, signed and numbered by Jane Partin. 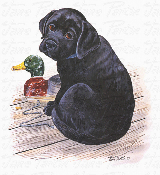 The painting of three puppies wrestling over a teddy bear is available as a limited edition print, signed and numbered by Jane Partin. 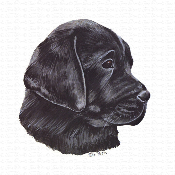 This Chocolate Labrador puppy print is availible as a limited edition Giclee print, signed and numbered by Jane Partin. 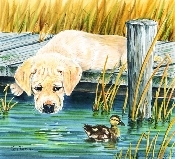 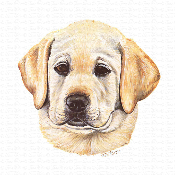 This Yellow Labrador puppy portrait is available as a limited edition print, signed and numbered by Jane Partin.